Really, really, really, really, light. This awesome tote can pack down so small that you’ll swear it’s not really there…but it still holds a ton when you need it to. Perfect sized straps and just the right number of pockets. You won’t find a better bag…only heavier ones! 12″ strap drop. Easy to carry. Comfy on your shoulder. Two insulated front pockets. Good for water bottles! Inside zipper pocket for little stuff. Main zipper closure. Keeps your stuff in when tossed in the back of the car or through the x-ray at the airport. Reinforced fabric loops to attach a messenger strap (sold separately) or attach other fun accessories. w10″ x h14″ x d1.5″ Machine Washable … air dry. 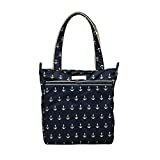 This entry was posted in Luggage and tagged Admiral, Collection, JuJuBe, Legacy, Light, Nautical, Tote by Perfect Vacation. Bookmark the permalink.